Dying of heart failure is not a pleasant way to go, but George Carlin never took the easy route. George Carlin's fans expected nothing but the blunt truth from him on stage; in his honor, here's a little blunt truth about heart failure. Think of the heart as having two sides with two chambers on each side. The atrium accepts blood and the ventricle pumps it. 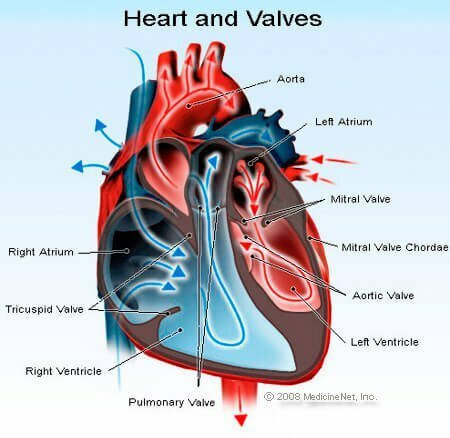 The right side of the heart receives blood from the body and pumps it to the lungs to get oxygen. The left side of the heart gets this blood back from the lungs and pumps it to the rest of the body. Right-sided heart failure means that the right ventricle doesn't have enough strength to pump the blood that arrived from the body toward the lungs. Gravity causes the blood to pool in the lower parts of the body, and fluid leaks from the blood vessels into tissues causing swelling of the legs (and if you sit a lot, into your buttocks). Left-sided heart failure is similar, except that the left ventricle doesn't have enough strength to pump blood out to the body, causing fluid to back up into the lung tissue, making it hard for oxygen (received from air inhaled) to bind to hemoglobin molecules in the blood. This in turn leads to increasing shortness of breath. Congestive heart failure is a condition in which right and left heart failure occur in the same patient. Regardless of the terms used, heart failure is a progressive failure of the heart to be able to meet the blood pumping needs of the body. It is not a disease to be ignored, but even with aggressive care, the mortality rate is high. Once the diagnosis is made, 50% of patients will die within five years. And it has other impacts as well; one-third of patients with heart failure are admitted to the hospital each year. Cardiomyopathy is the most common reason for the heart to fail. Whether the failure occurs because of coronary artery disease (narrowing of the heart's blood vessels causing a lack of blood supply to the heart muscle) or is due to heart muscle failure from complications of diabetes, alcohol abuse, or a variety of other potential causes - the end result remains the same. Symptoms of heart failure include shortness of breath, which occurs with exertion as the disease progresses. Lying flat increases blood return to the heart; thus patients may complain of shortness of breath (orthopnea) when lying down. Another symptom is paroxysmal nocturnal dyspnea, a term used to describe wakening in the middle of the night with shortness of breath that is more long-lasting than simple orthopnea. Patients often describe having to stand by a window to try to catch their breath. Patients end up sleeping on two or three pillows to elevate the head and chest, or in a recliner. The doctor's exam may reveal swelling in the legs and crackling or wheezing sounds in the lungs. Remember that all wheezing is not asthma. A chest x-ray may show an enlarged heart and excess fluid within the lungs. Heart failure treatment begins with diuretics to decrease the amount of fluid within the body and therefore the amount of fluid returning to the heart that needs to be dealt with and pumped by the ventricles. Other medications try to make the heart beat more efficiently to handle the work load. Increasing shortness of breath can be tempered by the medications; however, over time, the symptoms worsen and quality of life suffers. Eventually, the disease wins, breathing fails, and so does the patient. George Carlin was famous for his seven words that couldn't be said; although he said them enough that a generation knew them by heart. While Carlin's heart failed, his stories will live on.